The cocktail mafia of bars and bartenders who have controlled mixology in New York for decades is epitomized by Pegu Club’s stated ethos to “do a lot of little things well.” It’s the guiding principle of so many precious coupe glasses full of amber, copper, or mahogany liquid, sitting still and orderly. 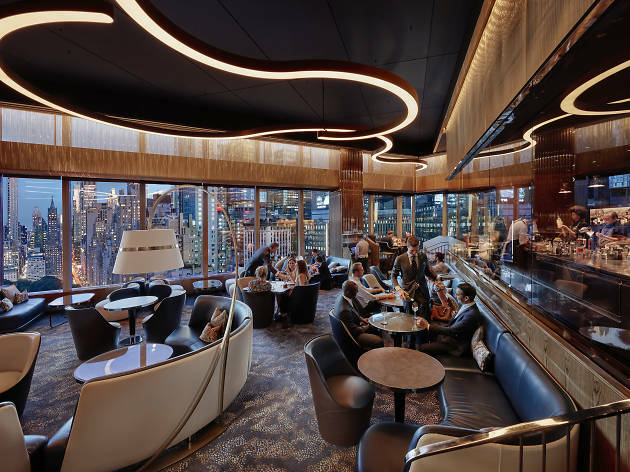 The Aviary NYC, an import from Chicago that has obliterated bartenders’ tedious habits to create grandiose thrills, doesn’t have an official ethos. 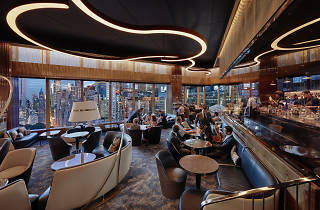 Instead, it has what you’ve always wanted a cocktail to be—and serves it in a sweeping 35th-floor Olympus that looks like Don Draper art-directed The Jetsons while listening to Carly Simon’s “Let the River Run” on loop. It does a lot of big things fantastically. The Science A.F. ($25 on a menu where the cheapest cocktail is $18), a pyrotechnic Rube Goldberg chemistry set of a drink—fire! fog! suction!—is not just a presentational spectacle but also allows customers to see their drink’s flavors birthed before their eyes. 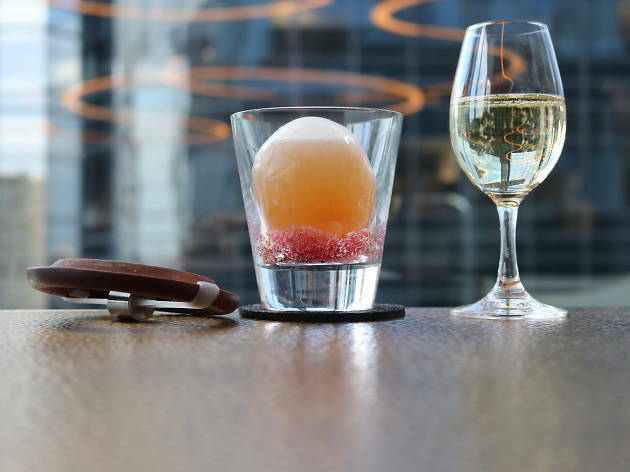 In the Rocks, a champagne-paired tribute to the New Year’s Eve ball drop, features an ice sphere that’s filled with Szechuan-peppered, Scotch-spiked old fashioned and is shattered on a bed of crème de cassis shaved ice. It’s up there with the feeling of tossing wine glasses into a fireplace or stomping a light bulb under a chuppah. Up the Ice Ante, with its skewered poker-chip stack of flavored ice discs hovering beside horchata, gives us a breathtaking reimagination of garnish. Every drink is drenched in the transformative taste of defied expectations. 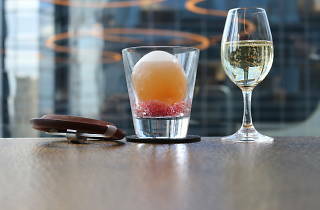 Under the superb stewardship of beverage director Micah Melton, the Aviary NYC is a many-times-over game changer. It is the work of astronauts in an industry of sea captains. If we could give it six stars, we would. We almost gave it zero stars because it so thoroughly supernova’d our universe. When we finally finished the giant crispy pork skin—a chicharrón that could easily double as a gladiatorial breastplate or a triceratops frill—a random waiter came over and said, “I am the Lorax, and I speak for the pork skin.” It’s the kind of giddy irreverence that can come only from knowing you are the best (and perhaps only) game in town. And here’s the best surprise: The Aviary is secretly understated, with the least elaborate of its flamboyant delights being the menu itself. Take the espresso martini, described as containing muscavado sugar, cold brew, coffee liqueur and vodka. But instead of Kahlúa, it uses a house-made mix of Venezuelan rum twice infused by way of nitrous oxide with La Colombe cold brew, Madagascar vanilla bean and a vintage 2010 caramel dream pu-erh tea. That’s its precious coupe of mahogany liquid. At the Aviary, even still waters run dope.